The 2016-2017 season had been in doubt at the beginning of the year for the Titans due to only having five returning players to the program. It was a stress filled summer for the program’s leaders, as they were forced to recruit with a sense of desperation in hopes of keeping the program afloat. 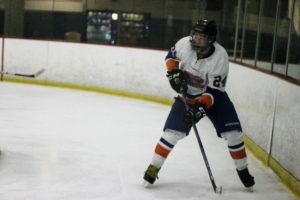 Luckily, the efforts were not in vain as a massive rookie class of 12 joined the Titan Ice Hockey squad. With a roster lacking a great deal of experience and depth, the Titans scrapped their way to a season just below .500, accomplishing much that they thought impossible at the beginning of the year. It was a season that saw the Titans grab a birth to conference playoffs, place 4th in the Los Angeles Kings College Cup, and most importantly, cement a rock solid core that the team can continue to build upon. Only losing three players from last year, the vibe is much different for Titan Ice Hockey ahead of the 2017-2018 campaign. It is no longer the goal for the program to simply “continue to exist”, but now the Titans look to make a huge impact in the ACHA. With one of the largest returning cores in program history, the 2017-2018 rookies will add a great deal of depth to an already strong roster, bolstering the chances of a dominant season for CSUF Hockey. personal level from each guy is going to get us there. I have a strong belief in this core as we all grew together last season. New guys bringing varying styles of play is going to make us much more dangerous, which is a recipe for a great season.” On a personal level, Bodge stated that his goal was to contribute offensively to the team and ultimately sit in the top 10 scorers within the conference. 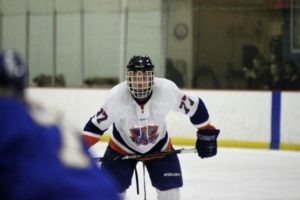 I also spoke with veteran forward, Ethan Chapluk, asking him what would be the biggest difference between this year and the last two seasons he played for the Titans. “Honestly, this year has an entirely different feel. With so many new faces to the core last season we all grew incredibly close to one another and we all have a similar drive to give all we can to this program. Our coach, Tony Cortes and our GM, Chris Houlihan, both give countless hours of their time to help us succeed which gives us a unique edge and with a reinvigorated roster thanks to a strong rookie class, I have a feeling we are going to do something very special this year.” When asked, Chapluk also stated that he has set himself some lofty goals, stating that he aspires to be a top ten scorer nationally, backed by work on both the physical and mental side of the game. 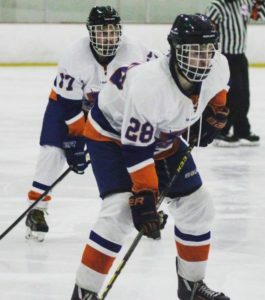 With their veteran players exuding both confidence and a strong game plan, it is clear to see that there is an exciting future in store for Titan Ice Hockey. In the mean time, your Titans plan on continuing the summer grind, getting ready for opening night against the University of Southern California on October 6th at East West Ice Arena, 9:15pm. Tusks Up!! !